Create your mail merge documents in Word and upload them to your DonorSnap database. 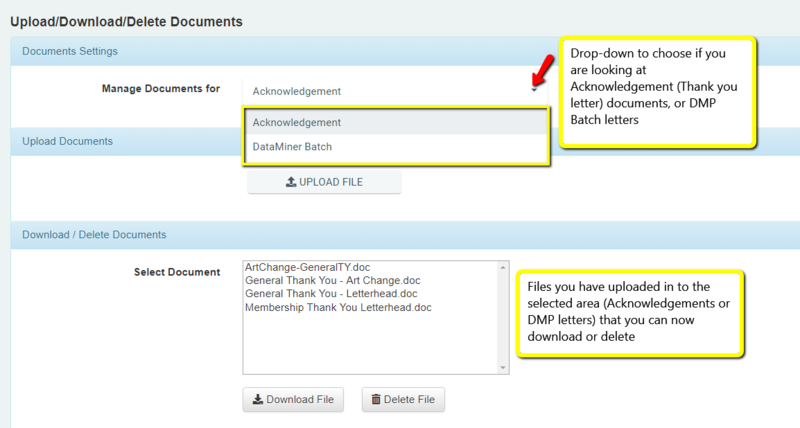 Use your documents to generate Acknowledgement Letters, DataMiner Batch Letters, envelopes, name tags, etc. On this page you can download previously uploaded letters or delete them entirely. After downloading an existing letter to your computer, make any necessary changes in Word and upload it back to DonorSnap. Acknowledgement is selected in the dropdown by default. In order to manage documents for the DataMiner Batch Letters system, toggle the dropdown at the top of the page. If a file is uploaded with the same name, a number will be added to the end of it. No files will be overwritten. Other word processing programs such as OpenOffice, LibreOffice , or Pages (Mac) may not be compatible. If using the Email PDF Acknowledgements, keep your Word-added formatting simple, and try not to use text boxes or apply effects to objects.